This is the new urban frontier, out in the great northeast beyond the Parc de la Ciutadella. Once, Poble Nou (also written Poblenou) was the busiest part of the city, packed with humming brick factories and workers' tenements. They called it the 'Catalan Manchester', the heart of Spain's modest Industrial Revolution. In the postwar decades many of those factories became obsolete, leaving the area a messy melange of aging neighborhoods and abandoned buildings. But over the last thirty years Barcelona has poured billions into its redevelopment, intending it to be the new home for everything that is hip and cool. First, in preparation for the '92 Olympics, they transformed a shabby waterfront into sports venues and the Vila Olímpica. Next came a massive renewal project at one of the nodes of the 1859 Cerdá plan, the 'Diagonal Mar' where Avinguda Diagonal meets the sea. Now, the big deal is something called 22@, a plan to redevelop the old industrial zones and pack them full of high-tech businesses. It's all still very much a work in progress, in a landscape punctuated by construction cranes, yet-unredeemed ruins covered in graffiti and plenty of fences. Some old factories have found creative new uses. In the big projects, the overall planning has been consistently abysmal, and the architecture a mixed bag, though there are some welcome signs that the city is beginning to learn something from its mistakes. From the Eixample, the gateway to Poble Nou is the Plaça de les Glòries Catalanes, right now a massive construction site. Eventually it will be a huge park and a major pole for development. Already, architect Jean Nouvel's pickle-shaped Torre Agbar and the Museu del Disseny have become modern landmarks of Barcelona. The streets east of the Glòries are a disorienting jungle of empty lots, drab new buildings and projects under way. This is the core area of 22@ (say it 'Vint-i-dos Arroba'), the 'District of Innovation'. It may not be much more attractive when they finish it, but the planners say it will have four million sq. meters of new work space and 130,000 jobs, hopefully concentrated in IT, medical technologies, media, energy and design. The flagship for all this future high tech wonderland, or at least the confection that architectural students are already coming to gawp at, is the Media Tic. The immense building site of 22@ gradually fades into a very different Poble Nou, a piece of old Barcelona that has survived pretty much intact. 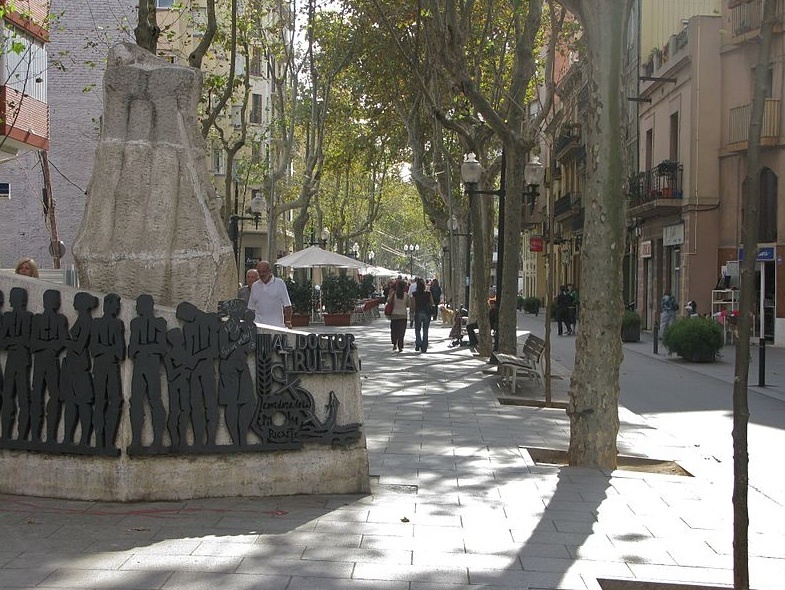 It even has its own ramblas, the Rambla de Poblenou, with some pleasant outdoor cafés and a sprinkling of colourful Modernista buildings from a century ago. One of the neighborhood landmarks is the Cementiri Vell, the 'old cemetery' where many notable Barcelonans are buried. Their taste in mausoleums could be as flamboyant as their architecture, but the star of this boneyard is the famous, macabre statue of the 'Kiss of Death' in section 3R (open daily 8-6pm). The cemetery is on Av/ Icaria, a name that recalls the former name of Poble Nou, and its unexpected origin as a pre-industrial utopian community. As part of the redevelopment, some big-name architects have been turned loose here too, notably Dominique Perrault, who brought his trademark gray-and-gruesome look from Paris to build the Meliá Barcelona Sky hotel, where the Diagonal meets C/ Pere IV. Across the street, you may not know what to make of Jean Nouvel's Parque Central de Poble Nou, but the architect wouldn't be disappointed to hear it. The intended effects will have to wait a few years until all the new plantings mature. It's a simple, natural park space, based on allées of willow trees and designed with children in mind. Already it seems a breath of fresh air in this quarter where so much is designed to death. On the eastern edge of Poble Nou, between the Rambla de Prim and the Besós river is Barcelona's poorest and most troubled neighborhood, La Mina, a quarter that takes you right back to the 1960's and Francoism. The dictator built huge estates like this one when he was filling Barcelona up with people from southern Spain, to work in the factories (and to dilute the Catalan population and culture). Barcelona and Madrid, were surrounded by shantytowns in those years, like so many third-world cities today. La Mina was one of them, and the rows of grim, cheap concrete slabs that replaced it would have seemed a great improvement at the time. In the opulent Barcelona of today they are merely chilling and prison-like, waiting for a promised rebuilding that may take decades. Meanwhile, the city has spent bottomless barrels of cash on La Mina's neighbor, the Forum/Diagonal Mar district, biggest of all the current redevelopment schemes. There's an urbanistic horror story at either end of Poble Nou. The aforementioned Glòries, first redeveloped in the 1980's, proved such a disaster that it had to be demolished only 20 years later. Here, 5km down the Diagonal, Barcelona wanted to create another major focal point. The city allowed an arch-corporate firm from Houston to develop the area, and a little bit of Texas culture is just what they got. There's a giant shopping mall, and a gated compound of luxury apartments. Local star architect Enric Miralles was called in to design the Parc Diagonal del Mar, an eerie seafront park where you can't even reach the sea. The esteemed Urban Land Institute in the U.S. gave the developers a prize for excellence, while the equally esteemed Project for Public Spaces has recently given the park their award as the Worst Public Park in the World. Barcelonans hate the whole kit and caboodle, calling it the 'anti-Barcelona'. The new city administration officially hates it too, but there's nothing to be done. Like the Glòries, Diagonal Mar will have to wait at least a decade or two before they can fix it back. The fun doesn't end there. Across from the shopping centre stands the Forum, the weird and wonderful blue, triangular convention centre by Swiss architects Herzog and de Meuron that starred in the debacle of Barcelona's 2004 'Universal Forum of Cultures'. Now it has been recycled as the Museu Blau, the new home of the Museu de Ciències Naturals. Outside it, the Parc del Forum hosts many of the city's big concerts and festivals; you can go swimming here too, in the enclosed Banys Forum, or rent a kayak or water-ski, or play urban Tarzan at the Barcelona Bosc Urbà. Right across from the Forum, an empty lot is all there is of what promised to be one of the more exciting of Poble Nou's architectural adventures. The late Zaha Hadid's Torre Espiral (Spiral Tower), a victim of Spain's financial implosion, very regrettably may never be built. Work seems stopped or stalled on a number of other projects too. From here, you can follow the reclaimed oceanfront back to central Barcelona. It's broad, sandy beaches all the way, with interruptions for a marina or two (the beaches, cleaned up for the Olympics, are a major reason for Poble Nou's current popularity as a place to live). At the centre of the strip, the most popular beach, Mar Bella, has a designated nudist area—right across the road from a kids' football ground. 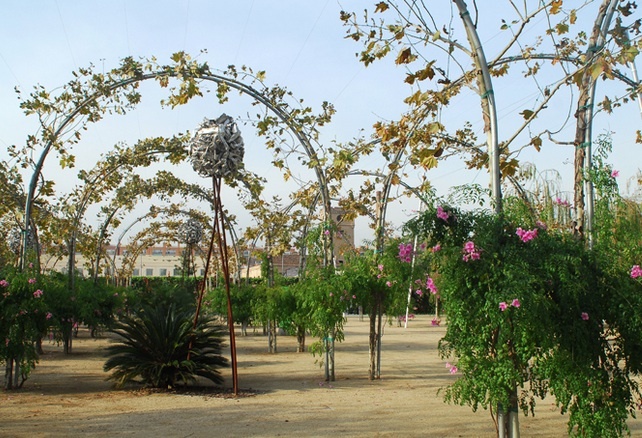 Next to this is the delightful Parc del Poblenou which extends for 11 hectares on what was once waste dumps and shanties. This is one of the city’s more successful designs, a series of undulating reclaimed grassy dunes, criss-crossed with paths made from the sleepers of the old Barcelona–Mataró train line (Spain’s first), and dotted with recycled sculpture and skateboard parks. The seaside promenade leads airily back to the western end of Poble Nou, and the Vila Olímpica, the glitzy seaward face of the 1992 Olympic games. Not much soul, but it certainly has crowds. The Port Olímpic, a jumping development of shops, bars, restaurants and clubs, is overlooked by a newly iconic sculpture, Frank Gehry’s shimmering giant copper Fish. 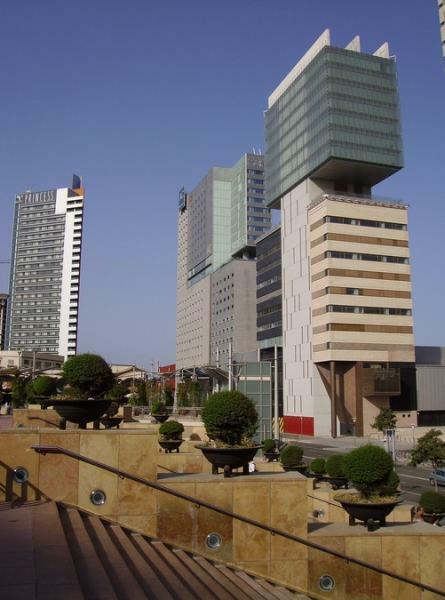 The two bland and symmetrical skyscrapers, visible from much of Barcelona, are the Hotel des Arts, Barcelona’s most luxurious hotel, and the Torre Mapfre, an insurance company.